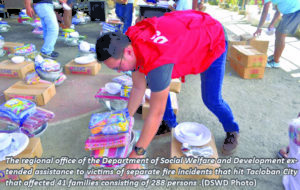 TACLOBAN CITY- Recently, the Department of Social Welfare and Development (DSWD) provided assistance to the victims of two fire incidents in Tacloban City. On November 13 at around 3:06 am, a fire broke out at Barangay 46, Juan Luna Street. According to initial investigation, the cause of the fire was electrical in nature. The fire resulted in 5 totally and 5 partially damaged houses, based on the same investigation. It affected 10 families (155 individuals, 96 of whom were boarders). The fire was put out at around 4:40 am. 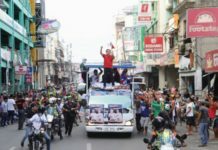 The estimated cost of damages is P4.5 million. Only a few days later, another fire broke out on November 16 at around 9:35 pm. Based on initial investigation, the fire was caused by an unattended candle at a boarding house at Brgy. 42, downtown. The fire also spread to Brgy. 39. Over-all, the fire resulted in 17 totally and 2 partially damaged houses. Over-all 31 families (133 individuals) were affected. 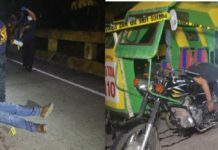 DSWD promptly responded to these incidents. DSWD staff from the Disaster Response Management Division (DRMD) conducted an onsite evaluation and coordinated with the City Social Welfare and Development Officer (CSWDO) to assess the needs of the fire victims. The Disaster Response Operations Monitoring and Information Center (DROMIC) focal person gathered data and in coordination with CSWDO and the DRMD project development officer, while the Regional Resource Operation Section (RROS) was also alerted to ensure the readiness of relief items for dispatch. Initially, the fire victims in Brgy. 46 were provided with family food packs, pots and pans, plates, bowls, tumblers and kitchen utensils.